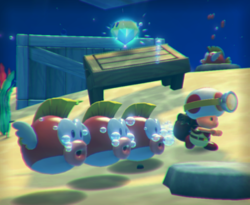 Briny Bowl Swimming Hole is the 12th course of Episode 1 in Captain Toad: Treasure Tracker. This level takes place mostly underwater. Captain Toad starts underwater and he must find the hidden Green Warp Pipe to reach the Power Star below the course. To reach the green Warp Pipe, the player must simply enter the red Warp Pipe underwater to reach the level above, then he must drop down onto the white square-crate (located underwater) from above. Raising this box will reveal the green Warp Pipe to the Power Star. A hidden Gold Mushroom can be found under the rectangular white crate in the center of the course. Super Gem 1: Inside a Pluck Patch underwater; guarded by a row of three Cheep Cheeps. Super Gem 2: On a wooden platform underwater. To reach the Gem, the player must use the blue Warp Pipe to reach the land above, then he/she must walk onto the wooden stairway ahead. This will cause the stairs to drop into the water, creating a path to the Super Gem. Super Gem 3: On top of a floating wooden platform near the center of the course. To reach it, the player must raise the large white crate in the center of the level, which causes it to float up and allowing the player to reach the Super Gem.